One component of the Zionist vision of the restoration of Jewish sovereignty was an aspiration for the judicial system of the Jewish state to reflect the principles of justice and cumulative wisdom of this ancient people’s legal tradition. Accessible, fair, inexpensive justice is an essential ingredient in every sound, civilized society. Despite the prestige of the Israeli courts worldwide, sizeable portions of Israeli society are alienated from them, feeling that they are not based on the foundations of Jewish law. Welcome to the Beit Din's website. On our website you can find out about the background for establishing the Beit Din and how it works. 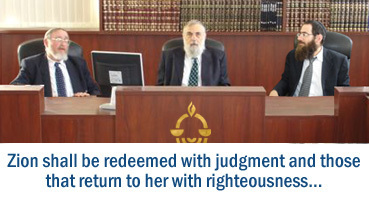 You can get to know the Beit Din's staff, board and legal advisors. It is possible to download the arbitration agreement which the Beit Din uses.